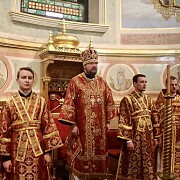 On Sunday, April 23, the Second Sunday after Pascha, the Administrator of the Patriarchal Parishes in the USA, His Grace Bishop John of Naro-Fominsk celebrated the Divine Liturgy in St. Nicholas Cathedral. 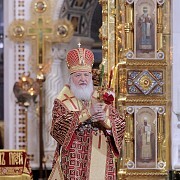 On Saturday, April 22, the Administrator of the Patriarchal Parishes in the USA, His Grace Bishop John of Naro-Fominsk led the Divine Liturgy on Bright Saturday in St. Nicholas Cathedral in New York City. 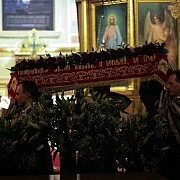 On April 16, the Administrator of the Patriarchal Parishes in the USA, His Grace Bishop John of Naro-Fominsk led the Divine Services for the Great Feast of the Resurrection of Christ in St. Nicholas Cathedral in New York City. 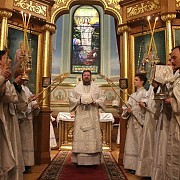 On the morning of Great and Holy Saturday, April 15, the Administrator of the Patriarchal Parishes in the USA, His Grace Bishop John of Naro-Fominsk led the Divine Liturgy of St. Basil the Great with the reading of the 15 Old Testament readings in St Nicholas Cathedral in New York City. 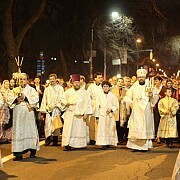 On Great Friday evening, April 14, the Administrator of the Patriarchal Parishes in the USA, His Grace Bishop John of Naro-Fominsk led the Matins of Great and Holy Saturday in St. Nicholas Cathedral in New York City. 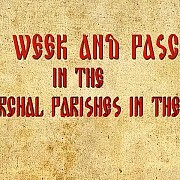 On April 14, the evening of Great and Holy Thursday, the Administrator of the Patriarchal Parishes in the USA, His Grace Bishop John of Naro-Fominsk led the reading of the 12 Passion Gospels during the Matins of Great and Holy Friday. On April 14, Great and Holy Thursday, the Administrator of the Patriarchal Parishes in the USA, His Grace Bishop John of John of Naro-Fominsk celebrated the Divine Liturgy of St. Basil the Great in St. Nicholas Cathedral in New York City. On Sunday, April 9, the feast of the Entrance of our Lord into Jerusalem, the Administrator of the Patriarchal Parishes in the USA, His Grace Bishop John of Naro-Fominsk led the Divine Services in St. Nicholas Cathedral in New York City. On Friday, April 8, the Administrator of the Patriarchal Parishes in the USA, His Gace Bishop John of Naro-Fominsk led the Vesperal Divine Liturgy of St. John Chrysostom in St. Nicholas Cathedral in New York City for the great feast of the Annunciation of the Holy Theotokos. 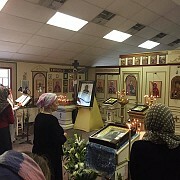 On Wednesday of the Sixth Week of Great Lent, April 5, the parishioners of St. Gregory Church in Tampa, Florida were graced by the presence of the Miracle Working Myrrh-Streaming Icon of the Mother of God "Softener of Evil Hearts". 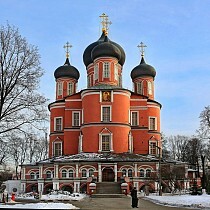 On Saturday, April 1, the feast of the Laudation of the Mother of God (Saturday of the Akathist), the Administrator of the Patriarchal Parishes in the USA, His Grace Bishop John of Naro-Fominsk led the Matins with the reading of the Akathist to the Mother of God and the Divine Liturgy in St. Nicholas Cathedral in New York City.